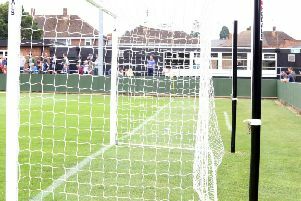 The Poppies were denied the opportunity to clinch the crown last Saturday after they suffered a 2-1 defeat to play-off contenders Alvechurch in front of over 1,500 fans at Latimer Park. 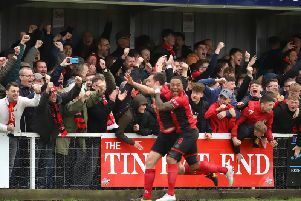 However, with other results going in their favour, Marcus Law’s team now know they require just one point from their final four matches to seal promotion to the Vanarama National League North. And the Poppies boss is keen to ensure his team make no mistake when they travel to Halesowen, who have to win to keep their hopes of avoiding relegation alive. “We felt a little bit low following all the hype for last Saturday and then not bringing it through,” Law said. “The strange thing is that, even though we lost, we are now closer to the title than we were before last weekend. While the Poppies will be looking to do the job themselves, their local rivals AFC Rushden & Diamonds could even do them a favour this weekend. Second-placed Stourbridge head to Hayden Road knowing only a win will do to keep their slim hopes of catching the Poppies alive. And Law added: “We know there is a game elsewhere that could have an impact on it all but we have got to focus on our own job. “Halesowen need the points for their own reasons and they, like Alvechurch, will want to stop us.